The progesterone receptor (PR) and androgen receptor (AR) belong to the nuclear receptor superfamily. Two isoforms of PR (A and B) have been identified with different functions. The expression of AR, each isoform of PR and their involvement in long-term effects on the endometrium after hormonal replacement therapy (HRT) or tamoxifen (TAM) treatment is not known. The aims of this study were to determine PR(A+B), PRB and AR distribution by immunohistochemistry in the macaque (Macaca fascicularis) endometrium. Ovariectomized (OVX) animals were orally treated continuously for 35 months with either conjugated equine estrogens (CEE); medroxyprogesterone acetate (MPA); the combination of CEE/MPA; or TAM. Treatment with CEE/MPA tended to down-regulate PR in the superficial glands, but increased it in the stroma. TAM treatment increased both the PR and PRB levels in the stroma. Overall, less than 20% of the cells were positive for the PRB isoform and less variation was observed after steroid treatment. AR was found in the stroma, mainly distributed in the basal layer of the endometrium in the OVX and steroid treated groups, but was absent in the TAM treated group. No AR was found in the glandular epithelium. The present data show that long-term hormone treatment affects the PR level, and also the ratio between PRA and PRB in the endometrium. Endometrial carcinomas are one of the most common cancers in women. Hormone replacement therapy (HRT) is commonly used for reducing menopausal symptoms, but is associated with an increased risk of endometrial carcinoma [1, 2]. Tamoxifen (TAM, estrogen antagonist in breast, agonist in uterus) is the most commonly used treatment for women with estrogen receptor (ER) positive breast cancers but the risk of developing endometrial cancer is also increased in those patients . Progesterone provides a protective effect in HRT by interrupting continued estrogenic stimulation of the endometrium . The risk of endometrial cancer has been shown to be decreased both after contraceptive treatment with progestin alone, and after continuous-combined HRT [5, 6]. However, the association between HRT or TAM treatment and endometrial cancer is still not clearly understood. The effects of progesterone in humans are mediated by two specific intracellular progesterone receptor isoforms, PRA and PRB [7, 8]. PRA is a truncated form of PRB, lacking 164 amino acids at the N-terminal region . The PR isoforms have different biological activities at the transcriptional level [9–11], and the ratio of the receptor isoforms can influence the responsiveness of the tissue to progesterone signals [12, 13]. Studies have shown that PRB is an effective activator of gene transcription [11, 14], and PRA has the ability to suppress the activity of PRB as well as other steroid hormone receptor family members, such as AR, glucocorticoid receptor and mineralocorticoid receptor [11, 14, 15]. In addition, liganded PRA and PRB can each suppress E2-stimulated ER activity, with the magnitude of repression dependent on the PR isoform, progestin ligand, promoter, and cell type . Androgens are generally believed to be hormones of the male, but androgens also have effects on the female reproductive system [17, 18]. Studies have shown that the androgen receptor (AR) is present in the human and nonhuman primate endometrium, but the results of AR distribution and regulation are contradictory [19–23]. A recent study indicated that androgens can antagonize estradiol (E2) action in the macaque and human endometrium, and that AR can play a role in the antiproliferative, "antiestrogenic" effects of antiprogestin in primates . However, the involvement of PR isoforms and AR in the pathogenesis of endometrial cancer is still not clear. Female macaques are similar to human beings in many aspects of reproductive biology, including the menstrual cycle [25, 26]. 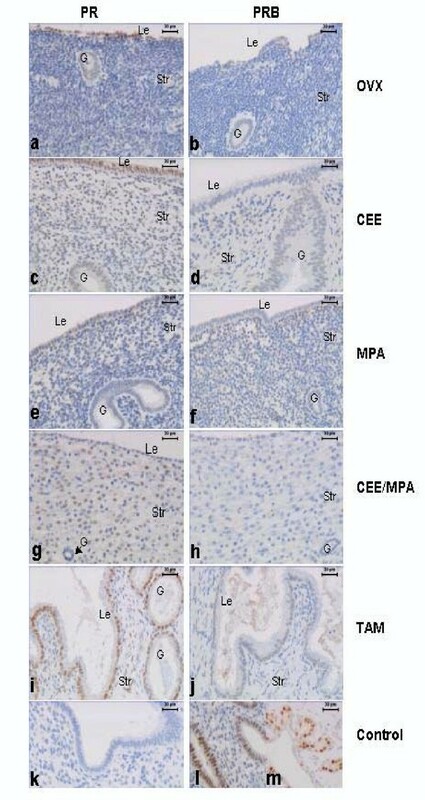 The aim of this study was to use the macaques as a model to compare the protein expression of PR, PRB and AR in the endometrium after long-term exposure to CEE (conjugated equine estrogens), MPA (medroxyprogesterone acetate), CEE+MPA or TAM, in order to clarify the possible roles of these receptors on the endometrium after long-term treatment with these compounds. The twenty-five female adult cynomolgus macaques (Macaca fascicularis) used in this study were imported from Indonesia to the United States. All the macaques were 4–6 years old at the beginning of the study. They were housed in social groups of 4–8 monkeys each in a facility. Bilateral ovariectomy (OVX) was performed three months before initiation of hormone treatment. Twenty monkeys were treated continuously with either 0.625 mg/day CEE (n = 4); 2.5 mg/day MPA (n = 5); the combination of CEE + MPA (n = 5); or 20 mg/day TAM (n = 6). Five animals were without hormone treatment and used as OVX controls. The compounds were administered in the diet for 35 months and are expressed as doses equivalent, on a caloric basis, to those given to women . The animal studies were approved by the association for the Advancement and Accreditation of Laboratory Animal Care and use committee in USA. Uterine tissues were collected at the end of the treatment period, when all the animals were euthanized. Tissues were trimmed from fat and connective tissues, and fixed in 4% paraformaldehyde for 24 hours and stored at 4°C in 70% ethanol. Thereafter tissues were trimmed to 3 mm in thickness and embedded in paraffin. Paraffin sections (5 μm) were used and a standard immunohistochemical technique (avidin-biotin-peroxidase) was carried out as described before  for immunolocalization of PR (A+B), PRB and AR. The different immunostaining procedures for each specific primary antibody are given in table 1. The samples were incubated with the primary monoclonal antibody, followed by incubation with the secondary biotinylated horse anti-mouse antibody (BA-2000, Vector Laboratory, Burlingame, CA, USA) and an avidin-biotin-peroxidase complex at room temperature. Replacement of the primary antibody with an equivalent concentration of non-immune mouse IgG was used for negative controls of PR, PRB and AR, respectively. Primary antibodies used in the study. Since a specific PRA antibody is not commercially available, the PRA level is difficult to measure directly by immunohistochemistry. The peroxidase substrate diaminobenzidine (DAB) was used to visualize the immunostaining reaction (SK 4100; Vector Laboratory, Burlingame, CA, USA). Thereafter the procedure was as described before . A Leica microscope and Sony video camera (Park Ridge, NJ. USA) connected to a computer with an image analysis software (Leica Imaging System Ltd. Cambridge, UK) were used to quantitate PR and PRB immunohistochemistry results, as described previously . In short, by using colour discrimination software the total area of positively stained nuclei (brown) was measured, and expressed as a percentage of the total area of cell nuclei (brown + blue). Since AR immunostaining was weak it was not possible to measure by the image analysis software and therefore the immunostaining intensity and distribution of AR were assessed semiquantitatively by manual scoring on a two point scale: - = no staining, + = faint staining, by one observer blinded to treatment. Statistical calculations for the immunohistochemistry results were performed by ANOVA on ranks (Kruskal-Wallis test) and significances were evaluated by Dunn's test (all compared to all) or Dunnett's test (all compared to control). Values with different letter designations are significantly different (p < 0.05). Values with * are significantly different (p < 0.05) to OVX control. Immunohistochemical localization of PR and PRB in the superficial endometrial stroma (Str), glands (G) and luminal epithelium (Le). Positive nuclear immunostaining for PR is present in the study groups as shown: OVX (a); CEE (c); MPA (e); CEE /MPA (g), and TAM (i). Nuclear PRB immunostaining is shown for: OVX (b); CEE (d); MPA (f); CEE /MPA (h) and TAM (j) groups, (bar = 30 μm). A negative control is shown for PR where the first antibody is replaced by mouse IgG (k). Positive controls for PRB immunostaining in human endometrium (l) and breast tissue from a CEE treated monkey (m), (bar = 30 μm). AR immunostaining from the basal layer of the endometrium is shown in: OVX (a); MPA (b) and TAM (c) treated animals. As positive control for AR immunostaining sweat glands from monkey breast tissue is shown (d), (bar = 20 μm). Variations were found in PR immunostaining in the superficial endometrium, whereas the immunostaining pattern was less varying in the basal layer. The statistical analysis was therefore performed on image analyses of the superficial layer. In the stromal cells, PR immunoreactivity was low in the OVX control group (Figure 1a). The immunostaining intensity and number of positive cells increased after treatments (Figure 1c,1e,1g and 1i). In addition, the stromal cells in the CEE/MPA group showed decidualization, and PR staining was intense (Fig. 1g). The image analysis showed an increased level in the CEE/MPA and TAM groups as compared to the OVX control (Figure 3a). Image analysis scores of positive PR immunoreactivity in superficial stroma (a), superficial glands (b) and luminal epithelium (c). PRB immunostaining is shown in superficial stroma (d), superficial glands (e) and luminal epithelium (f). Box and whisker plots representing the median value with 50% of all data falling within the box. The whiskers extend to the 5th and 95th percentiles. In OVX, MPA and CEE/MPA groups: n = 5, in CEE group n = 4 and in the TAM group n = 6. Values with different letter designations are significantly different (p < 0.05). Values with * is significantly different (p < 0.05) to OVX control. In the glandular and luminal epithelium, around 30–40% of the cells were positive in the OVX group (Figure 3b,3c). In the glands of the superficial layer, a faint PR immunoreactivity was observed in the MPA group (Figure 1e, and figure 3b). Only weak or no immunostaining was observed in glands of the CEE/MPA group (Figure 1g, black arrow and Figure 3b). Intense PR immunostaining was observed after TAM treatment in both glandular and luminal epithelium (Fig. 1i and Fig. 3b,3c). No positive immunostaining was found in the negative controls (Fig. 1k). PRB immunostaining was faint or absent in all compartments of the endometrium and in all studied groups (Fig. 1b,1d,1f,1h,1j). Intensive immunoreactivity of PRB was observed in the glands of human endometrium from the proliferative stage of the menstrual cycle (Fig. 1l) and also in the breast tissue of the CEE treated group of monkeys (Fig. 1m), which were used as positive controls. No PRB immunostaining was found in the majority of stromal cells of the OVX and CEE groups (Figure 1b,1d and Figure 3d). Around 1–5% of the stroma was weakly stained for PRB in the MPA, CEE/MPA and TAM groups. Image analysis results showed an increase after TAM treatment as compared to the OVX group (Fig. 1j and Fig. 3d). In the luminal epithelium, the PRB immunostaining was almost absent in the OVX control group. Around 10% of glandular and luminal epithelia were faintly stained after TAM treatment (Figure 1j and Figure 3e,3f), as well as in the glands of the CEE group (Figure 1d and Figure 3e). No significant differences were found between groups in the luminal epithelium and in the glands. In order to evaluate the relative level of PRA and PRB in the endometrium, the ratio of PRB/PR are shown in table 2. PRA is by far the most common isoform in macaque endometrium. The highest ratios of PRB/PR were found in the glands of the CEE group and in all compartments of the TAM group, suggesting an increased influence of PRB in these cell types as compared to the other compartments and treatment groups. Ratios of PRB/PR from the median values shown in Fig 2. No significant difference was observed. GE = glandular epithelium. LE = luminal epithelium. No AR immunostaining was found in the glands in any of the studied groups. Positive immunostaining was observed in some of the stromal cells, mainly distributed in the basal layer of the endometrium in the OVX (Fig. 2a), MPA (Fig. 2b) and CEE/MPA (not shown) treated animals (Table 3). No staining was present in the endothelial and smooth muscle cells of the vessels (Figure 2b, arrow). The TAM treated animals showed no positive AR immunostaining (Figure 2c and Table 3). Sweat glands from the monkey breast tissue, which was used as positive control, showed an intense immunostaining for AR (Figure 2d). Manual scoring data of AR immunostaining activity found in basal layer of endometrium. +, -, -, +, +. -, -, -, -, -. +, +, +, +, +. -, -, no, -, -. +, +, +, +, -. -, -, -, -, +. -, no, -, no, -. -, -, -, -, -, -. +, -, -, -, -, -. no, -, -, -, -, -. (-) = no staining, (+) faint staining, no = no luminal epithelium in the sample. In vitro studies have shown that PRA and PRB isoforms can activate different target genes. In vivo studies have demonstrated that the relative levels of PRA and PRB within endometrial cells may determine the nature and magnitude of their functional responses to progesterone and estrogen during the menstrual cycle . The results from the present study show that long-term treatment with the combination of CEE and MPA to OVX macaques, increased the PR level in the stroma, but reduced PR immunoreactivity in the superficial glands. TAM, a partial estrogen agonist in the uterus, increased the PR levels in the stroma, with a similar tendency in glandular epithelium. CEE tended to increase the PR level in the stroma and luminal epithelium, but no significant difference was observed. PRB immunoreactivity was weak in all groups. Less than 20% of the endometrial cells were positively stained for PRB in almost all studied samples, however, TAM increased the stromal PRB level. It has been demonstrated that estrogen increases, but progesterone reduces cell proliferation in the endometrium during the normal menstrual cycle, and also in long term treated OVX macaques. Both PRA and PRB can be regulated by estrogen and progesterone in the endometrium, and the distinct differences in the relative expression of PRA and PRB may be associated with different roles for the isoforms in the different compartments of the uterus . Pike et al. have reported that the continuous-combined estrogen and progesterone replacement therapy is not associated with an increased risk of endometrial cancer. The antiproliferative activity of progesterone in the endometrium may be the cause of reduced cancer risk. Although the mechanism of PRA mediated transdominant inhibition is still unknown, PRA can antagonize ER action  and has an ability to suppress the activity of PRB [11, 14]. The ER has important interrelationships with the PR system in modulation of biological responses. In many estrogen target tissues, e.g. uterus, estrogen increases c-fos mRNA levels, cell proliferation, PR mRNA and protein levels, gap junction formation and myometrial contractility. These effects are largely antagonized by progesterone . These findings give evidence of interactions and cross talk between members of the steroid hormone receptor family, which make the mechanism of the receptor activity even more complex. It has been shown in humans that a relatively high level of PRA continued to be expressed in the stroma, but not in epithelial cells of the progestin dependent luteal phase . It was suggested that the cell-specific effect of progestin indicated a different pathway in the regulation of PR isoforms in endometrial stromal cells . In the present study, the up- and down-regulation of PR (mainly PRA) by MPA/CEE found in the stroma and epithelium, respectively, is in agreement with a previous study on the PR mRNA expression . Taken together, the functional differences of PRA and PRB together with their different expression pattern in the different compartments of the endometrium suggest an important role for both isoforms in the cellular response to steroids. The relative level of PRA and PRB may determine the expression of specific genes upon hormonal stimulation. As for ER, PR function in the epithelium could be regulated by paracrine signals in the stroma, such as IGF-I and TGF-β4 [34, 35]. Studies have shown that endometrial cancers exhibit lower PR expression and a predominance of one PR isoform as compared with the epithelial cells of the normal endometrium, where the PR level was high and both PRA and PRB usually coexpressed . These authors suggest that loss of coordinated expression of PR isoforms is an early event in the development of endometrial cancer, since loss of expression of one PR isoform (A or B) was observed in hyperplasia . In the present study, TAM treatment induced cystic hyperplasia, but the PR level was increased in the glands and there was a higher ratio of PRB/ PR in this group. This suggests that the two PR isoforms coexist or that the ratio of PRB/PRA is relatively higher than in the other studied groups. However, PRA is still the predominant isoform in the epithelium as well as stroma in this group, since the PRB level is very low, which is partly consistent with the conclusion made by Arnett-Mansfield et al. . There is a tendency to increase in stromal PR levels after CEE treatment in the present study, but not even a tendency can be seen for PRB. Both PR and PRB are increased by TAM treatment. The conclusion could be that CEE regulates only PRA, while TAM regulates both PR subtypes. The mechanism of TAM-induced carcinogenesis is thought to be due to its estrogenic actions on the reproductive tract . However, the mechanism that controls the relative level of PRA and PRB in endometrial cancer and how TAM induces cancer needs to be further clarified. Studies have shown that exogenous androgen can have inhibitory effects on the female reproductive system [17, 18]. During the menstrual cycle, AR was mainly distributed in the endometrial stroma of human and nonhuman primates [23, 24, 37], and in occasional cells of the glandular epithelium, but was absent in the vascular wall . Though we found faint immunostaining of AR in the macaque endometrium, the stromal distribution was similar to the previous report . Slayden et al. have implied that under normal cyclic conditions, stromal AR levels seem to be up-regulated by E2 and suppressed by progesterone, which is contradictory to the impression of the present results on long term treatment. The AR-induced effects of endogenous androgens in the endometrium may be mediated mainly via the AR receptor in the stroma, but not the epithelium. A most interesting finding by these authors was that AR expression is enhanced in the endometrial stroma and induced in the glandular epithelium by antiprogestin (RU486) treatment. They suggest that the increased AR could mediate androgen dependent antiestrogenic effects induced by antiprogestin . In addition, we found no positive AR immunostaining in the TAM treated group, which suggests that TAM may down-regulate AR expression in the stroma. We have shown that in the superficial stroma the ERα level was lower in the CEE/MPA group than in the CEE and MPA groups . ERβ immunostaining was faint with minor variations in response to treatments, but increased in the superficial stroma after MPA treatment. The ratio of ERβ/ERα increased in superficial stroma and glands after CEE/MPA treatment, and also in stroma after MPA and TAM group. Cystic endometrial hyperplasia was observed in TAM treated animals, in combination with a high level of ERα protein expression. These data show that long-term hormone treatment also affects the ERα and ERβ protein levels in the endometrium, where the balance between ERα and ERβ seems to be important for the proliferative response to estrogen . The results on ERα  showed that there are more cells positive for ERα than for PR, in all tissues we examined. 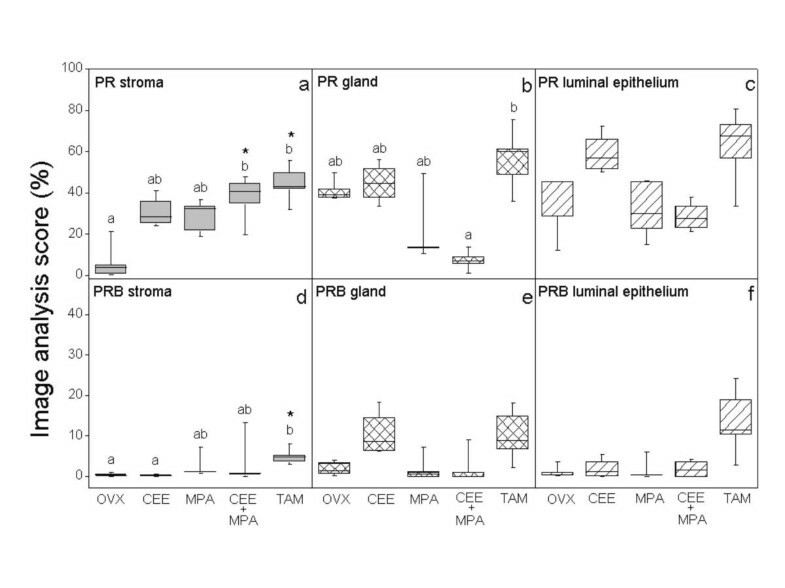 Similarities in expression pattern between ERα  and PR are that in the CEE/MPA group both proteins are decreased in the epithelium of the superficial glands, whereas TAM treatment exhibits the highest levels of both ERα  and PR in the luminal epithelium. In the stroma the combined CEE/MPA treatment reduced the ERα level, while the PR level was increased . The results of the present study indicate that PR is an important indicator of hormone responses in endometrium. The different expression of PRA and PRB might be related to the responses to hormone therapy and patient outcome. The endometrial hyperplasia found after TAM treatment could be due to the different ratio of PRA to PRB in the endometrium, possibly in combination with the increased ERα dominance after TAM treatment . Long-term treatment with steroids did not show a different distribution pattern of AR as compared to the OVX control, but AR was almost absent in the TAM group as well as in the CEE group. Further studies are needed to determine the importance of the interactions among the steroid hormone receptor members (e.g. AR, PRA and PRB, ERα and ERβ) for proliferative activity in the endometrium and possible side effects of HRT and TAM therapy. The present study received financial support from The Cancer Society in Stockholm, the Swedish Medical Research Council (grants 3972 and 5982), the Swedish Society for Medical Research and Karolinska Institutet.